Continuing my article on “Create a WordPress Theme with Bootstrap And underscores Step by Step“, I forgot to added how to change template on the wordpress comment form. In order to wordpress comment form can be adapted with bootstrap framework, it needed a wordpress function called ” comment_form() “. Using comment_form() function is quite easy and safe for your wordpress. For explanation comment_form() function can be read directly from codex.wordpress.org. comment_form() description is tag outputs a complete commenting form for use within a template. The point is to use comment_form() function , you can customize the look of the standard form belongs wordpress comment form in accordance with your imagine without change of the main core of wordpress itself. '<p class="comment-form-author"><div class="form-group"><label for="author">' . __( 'Name', 'domainreference' ) . '</label> ' . '<input id="author" class="form-control" name="author" type="text" value="' . esc_attr( $commenter['comment_author'] ) . '<p class="comment-form-email"><div class="form-group"><label for="email">' . __( 'Email', 'domainreference' ) . '</label> ' . '<input id="email" name="email" class="form-control" type="text" value="' . esc_attr( $commenter['comment_author_email'] ) . '<p class="comment-form-url"><div class="form-group"><label for="url">' . __( 'Website', 'domainreference' ) . '</label>' . '<input id="url" name="url" class="form-control" type="text" value="' . esc_attr( $commenter['comment_author_url'] ) . // change "Leave a Reply" to "Comment"
'comment_field' => '<p class="comment-form-comment"><div class="form-group"><label for="comment">' . _x( 'Comment', 'noun' ) . '</label><textarea id="comment" name="comment" class="form-control" rows="8" aria-required="true">' . 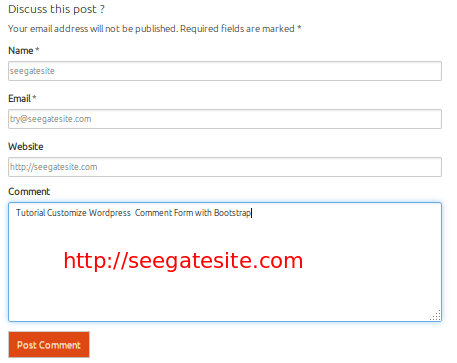 Save and see the results, wordpress comment form with bootstrap framework is ready to use. where to drop this code? function.php or comment.php ? Thanks! I have used this script, works fine!